While visiting my mom last year I discovered a recurring monthly $25 charge on her credit card statement that she couldn’t explain. (At the time she was living alone in her own apartment — fortunately she now lives with my sister and her family.) After hours of trying help mom remember what the fee was for and researching where the charge was coming from, I figured out that she had signed up for a “free” credit report which was now costing her $25 a month. Mom helping me figure out her bills. While I was talking to a customer service person at the credit report company (during my effort to cancel the fee and get a refund) I learned that mom had actually gone through the process of signing up, getting charged $25 per month, canceling it herself, then forgetting the entire ordeal, signing up a second time and being billed $25 per month for a “free” credit all over again. The $25 a month had gone on for several months each time. Yes, déjà vu all over again, as they say. Mom has been diagnosed with dementia. Her short-term memory is poor. She can remember pretty clearly what happened 50 years ago but 5 minutes ago is a challenge. I know a lot of people reading this understand from their own experience. Physically mom is in pretty great shape for an 86-year-old. She still plays an occasional round of golf and enjoys dancing at the senior center. She’s sharp mentally also in many ways — she taught me a new card game last year and beat me at it practically every time we played. It’s just the short-term memory problem. It can wreak havoc. Mom is a regular computer user, emailing friends, surfing the web, Skyping with us across the miles that separate us. For her age she is pretty high tech. But of course she’s old school, too. She isn’t computer savvy enough to use her Mac’s address book. Instead she keeps names, addresses and phone numbers in multiple address books, rolodexes, note cards, lists she tacks on the wall, on scraps of paper and old envelopes. When I was helping her organize all of it I noticed many people appeared in multiple lists with different addresses or phone numbers. I asked her how she knows which is the most current, she says “Oh, I just know.” But after quizzing her on a few of the people I knew, she really didn’t know. She can’t remember. I started to worry about how safe mom was online. She had responded to the “free” credit report offer twice, after all. What if someone really sinister sent her a phishing email asking her to enter her credit card number in some scam — would she know what was happening? 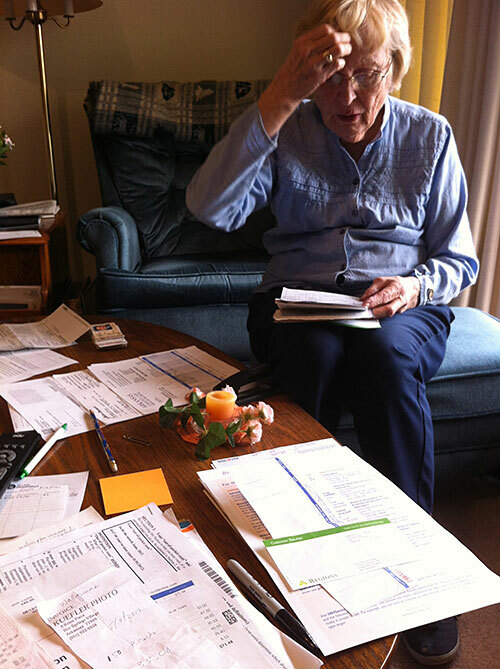 Not long ago one of my coworker’s parents, also senior citizens, nearly fell victim to a phone scam that had them almost ready to wire money to someone who claimed to be their own granddaughter in distress. In that case it was not an Internet scam, but it could have been, because as it turns out seniors fall victim to online scams a lot. Beyond the dangers of online predators, mom could get just plain flustered trying to figure out anything that went wrong with her computer. Even though she did pretty well most of the time, if she had to deal with some technical glitch her frustration grew quickly, and my ability to help her over the phone is waning. 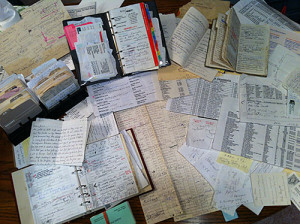 Mom’s address books, rolodexes, note cards and lists of addresses and phone numbers. Mulling all these things over, I started thinking about what could be done to help seniors connect with friends and family online, but in a safe and controlled way. My son John and I started working on a project together in our “spare” time that we think can help. We’re working on creating an iPad app that simplifies the computer experience, can be tailored to the ability level of the person using it, and can be set up to protect seniors from “getting into trouble” online. It does that by limiting the people with whom they communicate when using email, IM, and other means. The app can be set up to allow them to visit only predetermined websites. It’s an all-in-one computer and Internet experience within a single, simple, safe app. Post script: The app was launched on the Apple App Store in fall 2014 and after a nearly two-year run we decided to remove it from sale. Unfortunately the required investment in continued development time to keep the app up-to-date with ongoing iOS releases made it economically unfeasible to continue. Nonetheless, many customers reported that their loved ones benefitted greatly from the app. And for my son and myself it was a phenomenal learning experience.